1. First hypothesis: Monophyletic: It describes that these phyla are related due to following common structures: Pseudocoelom, Cuticle, Muscular pharynx and Adhesive glands. 2. Second hypothesis: Polyphyletic: This hypothesis describe that these phyla are not related to each other. Therefore they are polyphyletic. There is absence of any single unique feature found in all groups. 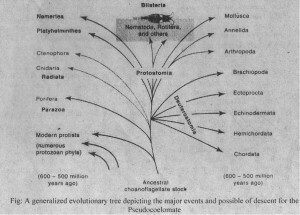 It strongly suggests that there is independent evolution of each phylum. These animals are adapted to similar environments. .lberetbre. similarities among them are due to convergent evolution. 3. Both monophyletic and polyphyletic: The correct phylogeny is in between the two hypotheses. All phyla have some common anatomical and physiological features. Thus they are distantly related to each other. Convergent evolution has also produced ome analogous similarities. But each phylum arose from a common acoelomate ncestor. 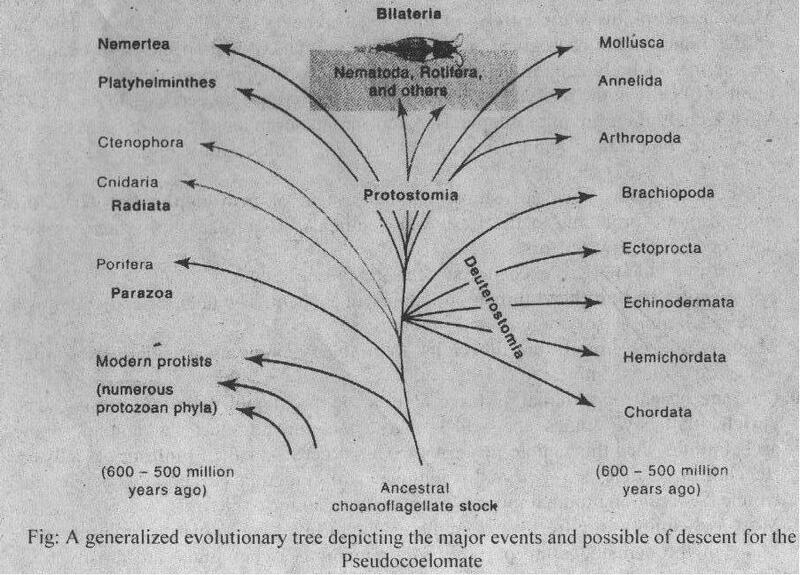 It diverged very early in evolutionary history. Such ancestor is a primitive ciliated acoelomate turbellarian. Therefore, it is concluded that the first ancestor was ciliated, acoelomate, marine and monoecious. It lacked cuticle.